* ❤ Khaori Sato オフィシャルブログ ❤ *: Got my new DSLR! Last Sunday, We decided to go out for shopping..
Last week, I just bought my new compact camera (Nikon coolpix). Yes, its really a nice camera but still I really want to buy a DSLR! At first, I was soo confused which DSLR should I buy. Either Canon EOS Kiss X4 (550D or T2i) or Nikon D3100. Then after my sister's shopping, we went to KS Denki & Joshin. At KS Denki, their deal for the camera is about 75000yen for Canon and 55000yen for Nikon..
After that, we also went to Joshin to check their deal for the camera. Their selling their Canon and Nikon for 82000yen. Yes, same prize but its already a dual lens kit. My mom gonna buy a new TV for our bar and she found a great deal for the TV. And the shop crew said that if we're going to buy the TV and the camera for that same day, they can give us a discount for my camera!! and they just sell it for 75000yen! 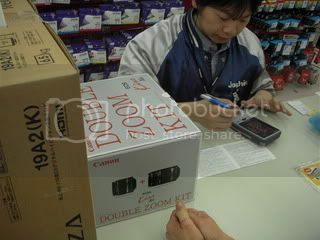 Compared it to KS Denki's offer, Joshin's deal is more better because its a dual lens kit already.. so I decided to buy my SLR from Joshin.. Finally, I can now take a better quality pictures and videos!! quality looks great I need a new camera!